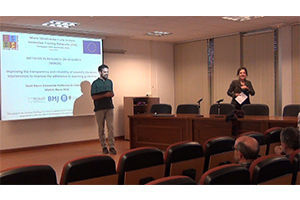 On March 5, 2019 our fellow David Blanco gave a 2h seminar for professors and doctoral students at the Department of Basic Psychology and Methodology of the Universidad Autónoma de Madrid (UAM) focusing on the content and progress of his PhD project under the MiRoR project, “Assessing interventions to improve adherence to reporting guidelines”. After introducing the various measures that have been put in place in recent years to improve the quality of the information contained in scientific publications, he analyzed how the different parties involved in research projects, from funding agencies to scientific journals, can contribute to this improvement. Finally, he presented the details of a study that he is carrying out in collaboration with the BMJ Publishing Group to put into practice and evaluate the impact of an editorial intervention to improve the transparency and reproducibility of articles published in one of the most popular open access journals of this editorial group, BMJ Open.